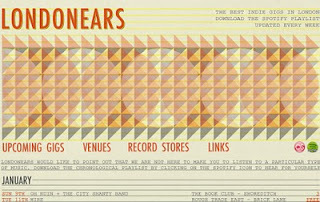 I've stumbled across a great little London gig guide website called LONDONEARS and thought I'd share. In general it covers the types of bands you'd read about on this website. It's got a nice clean layout, no navigation headaches/adverts and you can see all you need to know i.e. location/date/price on the home page. Other pages on the site include London music Venue locations and Record Stores displayed using Google maps. There's also a Spotify playlist made up of the bands on the upcoming gigs list. Thanks London Ears, sure beats the hours of copying and pasting I used to do for my weekly upcoming concerts posts. Now I just need to shake myself out of my mid hibernation mode and push myself out the front door to see some of the shows.